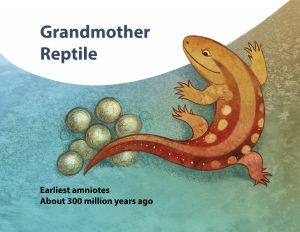 Get the groundbreaking book that teaches evolution to preschoolers! Grandmother Fish is also available in digital format. Grandmother Fish is available in the UK. 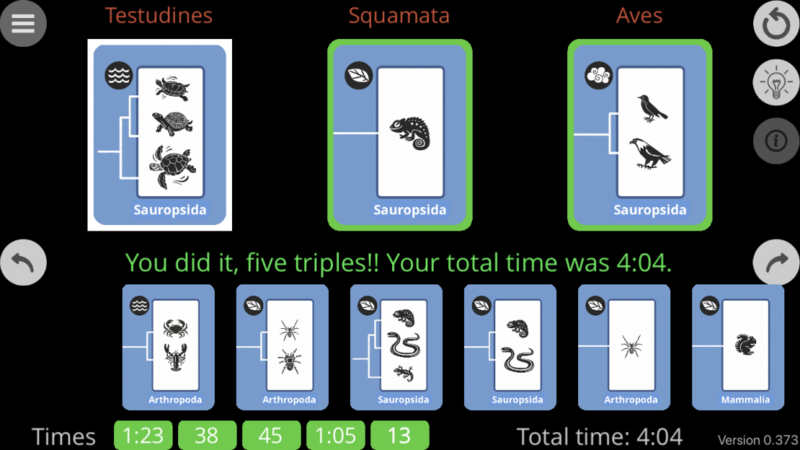 A fast version of Clades for iOS and Android. Available Darwin Day, February 12th, 2019. When teachers present Grandmother Fish to classrooms, it’s handy to have images of the five Grandmothers. Here are full-size images of the Grandmothers, each to be printed on a letter-size sheet of paper. Sometimes for a reading I have five different kids volunteer to act out the sounds and motions of one Grandmother each. In that case, each kid can hold the image of their Grandmother for the class to see. When I do timeline exercises, again I get five kids to volunteer to stand up and show everyone where on the timeline their Grandmothers lived. Now that I have these images, each kid will get one to hold. Click on an image to get the full-size PDF. 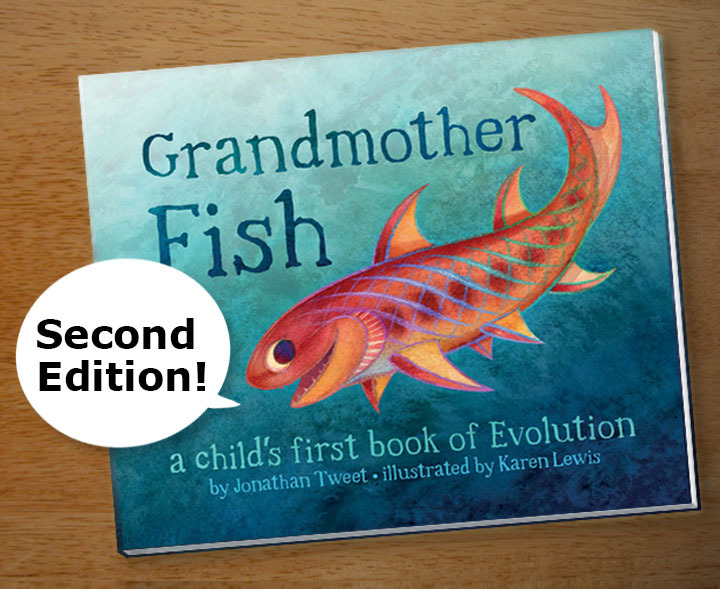 From GRANDMOTHER FISH: A CHILD’S FIRST BOOK OF EVOLUTION. Illustrations © 2016 by Karen Lewis. Reprinted by permission from Feiwel & Friends. All Rights Reserved. If you use these images in a classroom, Karen and I would love to hear about it. Enjoy! Know any elementary school teachers in the US? How the Dormacks Evolved Longer Backs and How the Piloses Evolved Skinny Noses are two fictional books that demonstrate adaptation by natural selection. If you’re a grade school teacher in the US, you can click below to get free copies and teaching materials. These two great books come from the Evolving Minds Project, funded by the National Science Foundation. They feature evidence-based approaches to teaching evolutionary concepts to kids, grades K–5. These people are also fans of Grandmother Fish. It’s wonderful to have evolution educators like the people at the Evolving Minds Project approve of our book. This post provides online resources for fans of evolution for kids, parents, and educators. When I was working on Grandmother Fish, I naturally looked around for other evolution resources that were already available. Evolution: How We and All Living Things Came to Be, by Daniel Loxton. Ages 8–13. Great book on the science of evolution. Loxton did the art as well as the text, so it all works together beautifully. Covers answers to common misconceptions and arguments against evolution. Evolution: The Story of Life, by Douglas Palmer. High school to adult. The sheer scope of this book makes it a must-have. Spread after spread is a full-color scene from prehistory, from the earliest suggestions of life to prehistoric humans. Page after page, you see the history of life on earth play out. It gave me a greater appreciation for the vast diversity of living things over the last billion years. The art isn’t flashy, but it’s effective, and there’s an insane amount of it. The writing is dense, and there’s nothing kiddie about the book, but it’s filled with illustrations and photos that kids would love to pore over. Best yet, in the US you can buy this $48 book used for under $10, including shipping. Our Family Tree: An Evolution Story, by Lisa Westberg Peters. Ages 4–7. This sweet picture book is a lot like Grandmother Fish, but for older kids and with more detail. It recounts our lineage starting with the origin of life itself. Science notes in the back provide a context for the lyrical story. It’s high on folks’ lists of good evolution books. Great Adaptations, by Tiffany Taylor. Ages 8–12. Illustrated poems describe ten evolutionary findings or concepts. After each poem is a description of the scientific work that it’s based on and the evolutionary scientist involved in that work. 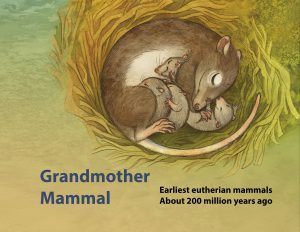 The one about the emotional connections among early humans is especially cute, and this poem’s art is also especially cute. Kids love illustrations of happy families. The rhyming nature of the stories means you can read them to younger kids. Grandmother Fish, by Jonathan Tweet. Ages 3–6. My passion project for 15 years, finally published. See my Grandmother Fish page. Go Extinct! game, Ages 8+. This card game is a variant on Go Fish uses our evolutionary family tree. Two hundred years ago, animals were categorized into broad groups, such as “reptile” or “bird.” Today we place each species on a continuously forking evolutionary line of descent, with each species related to the others according to what forks they share. The phylogenetic tree, as it’s called, is like the periodic table of elements except for species. And since it reflects evolutionary history, it’s complex and disorderly. 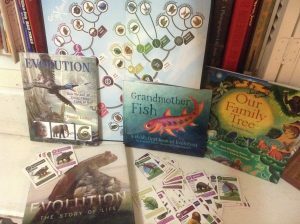 Getting kids to play a game that familiarizes them with the evolutionary tree of life seems like a great way to get them thinking in evolutionary terms. 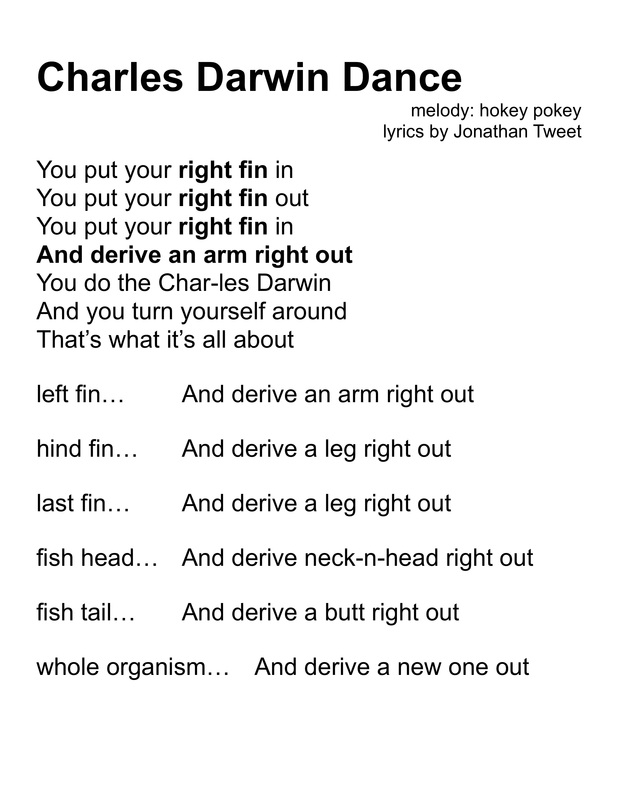 There’s phylogenetic tree in Grandmother Fish, and kids respond strongly to it. Clades & Clades Prehistoric games, Ages 6+. Karen’s and my evolutionary card games. See my Clades & Clades Prehistoric page. Understanding Evolution web site. For adults. This academic site is where you turn for expert opinion. 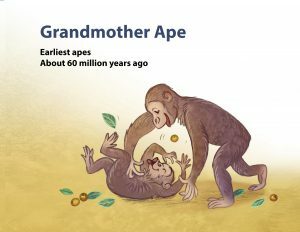 If you want to know what your kids should know about evolution at each age, this site will tell you. It includes links to all sorts of resources about evolution. A project of the University of California Museum of Paleontology and the National Center for Science Education. National Center for Science Education web site. For adults. This organization promotes greater understanding of evolution and climate change. It’s a fine advocacy site for adults, and it has plenty of resources for kids, too. They were a big help with Grandmother Fish. PBS web site. For parents. PBS is great for science and has an evolution site. 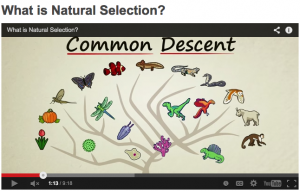 Here’s a high-school-level video that explains natural selection. The Nova site has its own evolution page. Natural selection can be hard to understand because it doesn’t match human expectations of how things work. These notes are designed to help a layperson, especially a parent, explain natural selection to a child. Elaborate each point at your child’s level, and explain it a little at a time. A version of these guidelines appears in Grandmother Fish. These notes are also available as a 1-page PDF (click here). You might also be able to point out examples in your family of heredity and diversity. Baby animals grow up to be a lot like their moms and dads. A puppy grows up to be a dog, not a cat or a fish. Babies grow up to be a little different from their parents. Some differences make life easier, some make life harder, and some don’t matter. Differences just happen. Over time, the differences add up, so animals today look very different from the mom animals and dad animals from a long time ago. Dogs look different from how dogs used to look a long time ago. People who wanted big dogs picked big dogs to have puppies. After a long time, their dogs were bigger than before. Other people got different kinds of dogs, like small dogs or fluffy dogs. All the different kinds of dogs come from one kind of dog that lived a long time ago. Natural selection works because some individuals leave many more surviving offspring than others do, who may die before reproducing or have few descendants for other reasons. These guidelines hint at death but don’t mention it. Address the topic in ways suitable to your children. Living in nature is dangerous for animals. Animals have ways to keep themselves safe. Baby animals are born with differences, and some differences make them safer. Animals that keep themselves safer have more babies. A long time ago, one group of animals climbed trees to be safer, and the best climbers were the safest. The best climbers had the most babies, who were also good climbers. After a long time, these animals had evolved into animals that were really good at climbing trees. In different parts of the world, animals found different ways to be safe, so they evolved into different kinds of animals. For example, one sort of animal from a long time ago evolved into the lions, tigers, wolves, foxes and bears that are alive today. Here’s a dance I like to teach children when I do author readings and school visits. The creative team behind Grandmother Fish—Jonathan Tweet and Karen Lewis—also created these games and funded them on Kickstarter. SEATTLE (May 1) — Clades and Clades Prehistoric are now available to the general public from Atlas Games in St. Paul, Minnesota. Game designer Jonathan Tweet and children’s science illustrator Karen Lewis collaborated to create these games, which demonstrate the concept of a clade. In biology, a clade is a complete branch of the evolutionary tree, such as mammals. Players try to be the first to spot matches among the cards on the table, forming matches according to the animals’ clades and other qualities. Clades features living animals, such as a praying mantis, an eagle, and a human. Clades Prehistoric plays the same way but dinosaurs, sea scorpions, woolly mammoths, and other extinct animals. Tweet and Lewis raised money on Kickstarter to produce Clades and Clades Prehistoric, and copies of the game have been sent to the backers. The backers also raised money to send over 100 copies of the games to nonprofits around the country, such as Camp Quest and the National Center for Science Education. Now that the obligations to the backers have been fulfilled, Atlas Games has released the games to the general public. The games will appear in game stores and bookstores, along with Atlas Games’s broadly popular titles such as Gloom and Once Upon a Time. 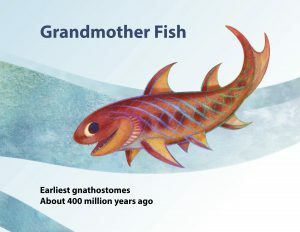 Clades and Clades Prehistoric are follow ups to Grandmother Fish, the first storybook to teach evolution to preschoolers. In 2015, game designer Jonathan Tweet and children’s science illustrator Karen Lewis self-published Grandmother Fish, which sold out and was then picked up by Macmillan for release in 2016. It has since been translated into Italian, and a Chinese translation is in progress. For more information, contact info@grandmotherfish.com. About Jonathan Tweet. Jonathan Tweet is an award-winning, Seattle-based game designer, having contributed to global brands such as DUNGEONS & DRAGONS, MAGIC: THE GATHERING, and POKEMON. His innovative game designs earned him a place in The Academy of Adventure Gaming Arts and Design Hall of Fame, and he has placed a special emphasis on explaining complicated games in simple terms. Currently he is consulting with the Science Museum of Minnesota on an upcoming program for teaching evolution. About Karen Lewis. Karen Lewis is a Seattle-based illustrator for children’s storybooks, history, and science. She strives to make her art accessible, accurate and visually delicious. Favorite clients have included the Point Defiance Zoo and Aquarium, the Seattle Aquarium, Seattle Art Museum, Seattle Public Schools, Seattle Public Utilities, KCTS public television, King County and the National Science Foundation. She’s the resident cartoonist for Cobblestone, an American history magazine for kids. Her children’s book include Will it Blow – Become a Volcano Detective at Mount St. Helens, Amazing Alaska and Arturo and the Navidad Birds. The prehistoric mammals of the air are bats, two early bats, Icaronycteris and Onychonycteris, and an even earlier protobat, which is hypothetical. Icaronycteris (“Icarus bat”) evidently hunted moths with echolocation about 50 Mya, which bats commonly do today. Onychonycteris (“clawed bat”) is the most primitive bat found so far. It had claws on all five of its wing fingers, unlike two for Icaronycteris and one for modern bats. 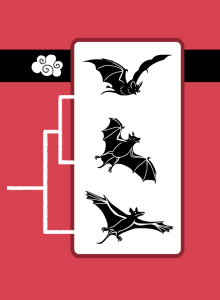 These flying bats evolved from hypothetical protobats that could glide. They may have evolved from tree-climbing mammals that hung upside down to eat fruit or worms in the fruit. Today we think of bats as living in caves, but originally they evolved in trees, as did the first placental mammals. Here’s the 4-minute speech I gave at the March for Science in Seattle, Earth Day 2017, April 22. That’s Karen up on stage with me, wearing a coral reef on her head. It was an honor to speak and a joy to march. My topic is how evidence can unite us all. 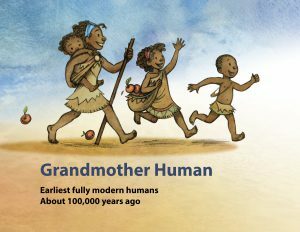 My book, Grandmother Fish, gives children evidence for evolution when they wiggle like a fish and hoot like an ape. Kids love learning that humans are part of the great family of animals. Evidence also says that humans are all one family, as Charles Darwin concluded. Evidence can unite the human family because it allows people to share ideas across cultural boundaries. 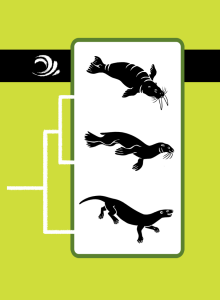 The prehistoric mammals of the water are pinnipeds (“fin foots”): the walrus-like Valenictus; the seal-like Enaliarctos; and the otter-like Puijila. Valenictus lived around 5 Mya, and it had no teeth other than its tusks. It evidently ate mollusks, like modern walruses do, rather than fish, as the earliest pinnipeds did. Enaliarctos (“Arctic sea bear”) lived around 20 Mya. It caught fish but took them back to land to eat them, rather than eating them in the water as modern seals do. Puijila (“young seal”) looked like an otter but is more closely related to seals. Charles Darwin speculated that a land-living, fish-hunting species could evolve into an aquatic species as they spent more and more time in the water, and the Pujila fossils provide strong evidence for just this process. The prehistoric mammals of the land are two xenarthrans (“strange joints”) and an afrothere (“Africa beast”). 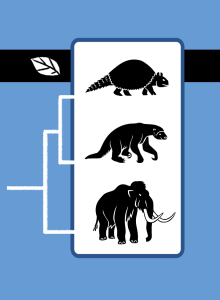 The xenarthrans are a glyptodont and a ground sloth, while the afrothere is a mammoth. Glyptodonts (“carved tooth”) were giant armadillos that arose about 20 Mya. Their armor protected them from giant flightless birds and other predators. Ground sloths evolved great size to protect themselves from most predators. They appeared about 35 Mya. Sloths are closely related to anteaters. Like all xenarthrans, they have long, clawed toes and low body temperatures. Xenarthrans evolved in South American after it split from Africa, and they spread to North America when the two land masses connected to each other 3 Mya. Afrotheres evolved in Africa when it was separate from the other land masses, leading to aardvarks, shrew-like tenrecs, manatees, and elephants. Elephants later spread into Asia, and mammoths reached North America. Glyptodonts, ground sloths, and mammoths died out with the end of the last ice age and the arrival of human hunters. Xenarthra and Afrotheria diverged from the other placental mammals long ago in the Mesozoic. Their ancestors either split off separately but at nearly the same time or they split off together and then diverged from each other soon afterwards.